This article previously appeared in High Country News. Fifteen years ago, I moved my young family from the San Francisco Bay Area to Eugene, Oregon, into a small house with a woodstove. I was excited about heating with wood, and resolved to do it safely. I built a woodshed in the backyard, close to a Doug-fir chopping block. I learned to send split logs flying by swinging the maul with all my might, without ever whacking my shin. My kids played around the stove while it popped and roared, without any anybody ever getting burned. But I refused to buy a chainsaw. Chainsaws seemed too loud, too deadly, too much like guns. So, for 14 seasons, I split, stacked and, when necessary, pushed a handsaw to put up our year’s heating supply. I never thought of touching a chainsaw. Then, last winter, a violent ice storm hit Eugene and knocked down power lines, limbs and whole trees. When it was over, my neighborhood was covered with free firewood. The following week, I dragged five pickup loads of fallen limbs into my backyard. The prospect of hand-sawing all that wood to stove length made my elbow ache. Laziness overcame liberal bias. I bought a chainsaw. I didn’t like chainsaws as long as only other people owned them, but once I owned one myself, I discovered they embody some of the best rural values. 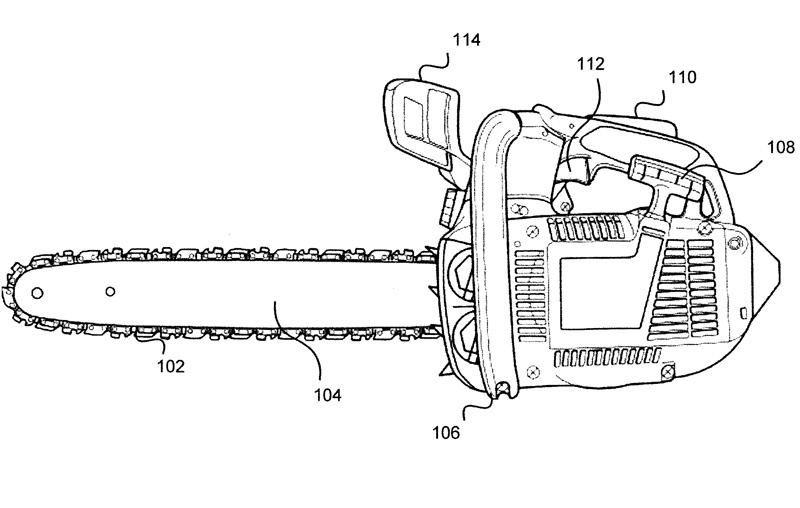 For example, it was nature herself that inspired the premier innovation of the modern chainsaw: the “chipper chain.” The idea for the chipper chain came to an Oregon logger named Joseph Cox on an autumn day in 1946, while he was watching a timber worm chew through dense sapwood. Timber worms chew by deftly coordinating two sickle-shaped mandibles in an alternating measure-cut pattern. One mandible acts as a gauge to set the proper cutting depth for the other mandible, ensuring that it won’t get stuck by digging in too deeply. As soon as the cutting mandible finishes its slice, it becomes the depth gauge for the other mandible’s cut. Cox’s simulated this right-left, measure-cut action by designing a saw tooth shape that combined a cutter with a depth gauge. He attached these dual-function teeth to alternating positions on the right and left sides of a wide bicycle-style chain. When powered around by a small gas engine, the chipper chain cleanly opened a groove through wood fiber without grabbing or overloading. Further innovations transformed the chainsaw into a beloved tool that fostered a rural guy’s pride in self-reliance. Lighter, more durable designs meant that a man could trust his chainsaw to guide him through timber in all kinds of territory, all day long. A man could bond with his chainsaw and, when he grew too old to work, pass it down to his kids and grandkids. And yes, some women love their chainsaws, too. Today, in the Oregon rain forest, a trusty chainsaw can still get you out of a pinch. Mushroomers keep one in the pickup while they gather shiitake on windy days, in case they have to cut their way through a blown-down Douglas fir on the drive home. Some fly fishermen carry one in the bow of their drift boat, in case they round a bend and run into a tree across the river that wasn’t there the last time they floated by. I’ve never used my chainsaw outside my backyard. But I think that owning, caring for and working with my chainsaw let me taste the same pride and pleasure that responsible gun owners must feel in living safely and skillfully with a dangerous object. When I bucked up all that free firewood, I enjoyed the physical exertion and relaxed concentration required to keep the saw cutting logs — and not my kneecap. Jourdan Arenson is a contributor to Writers on the Range, a column service of High Country News (HCN.org). He lives in Eugene, Oregon. This article previously appeared in High Country News.